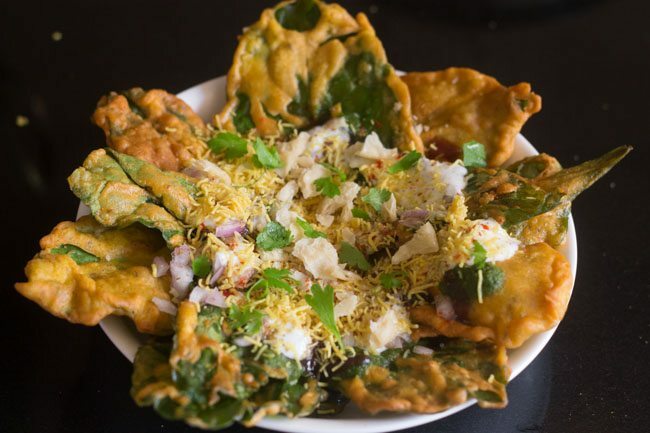 palak patta chaat recipe - crisp fried palak pakora topped with spicy green chutney, tangy and sweet tamarind dates chutney and onions, sev and spice mixes. 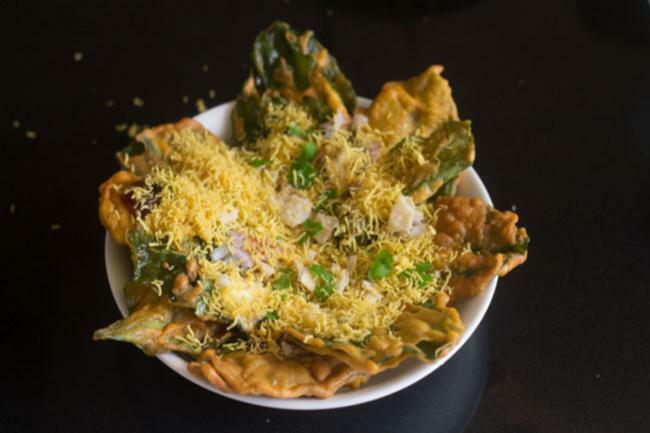 palak chaat recipe with step by step photos – there are many ways to include spinach in your meals and here is one chatpata way….. that of palak chaat. my mom had shared this palak chaat recipe with me on the phone. 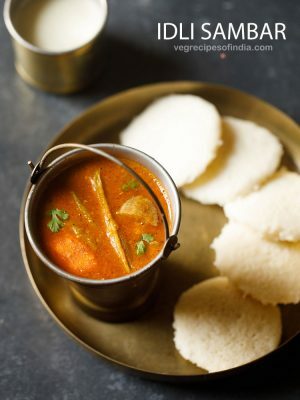 she had seen this recipe on some tv channel and shared the method. 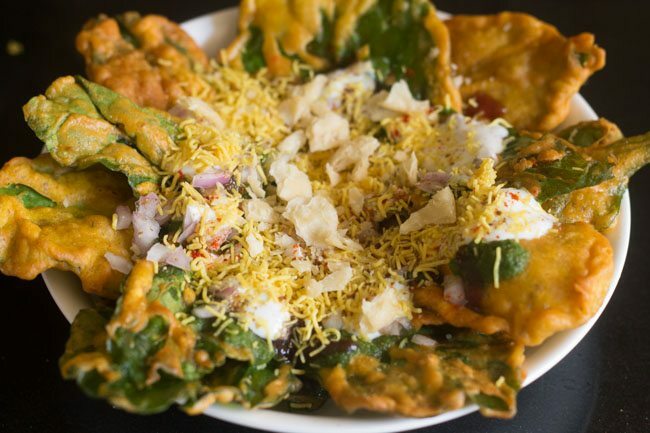 the only flipside in this chaat recipe is that spinach pakora (fritters) are fried. 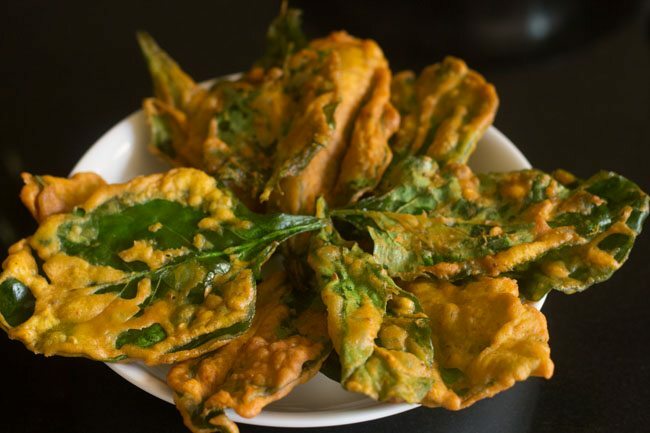 each spinach leaf is coated with besan (gram flour) batter and fried. but that is what makes this dish crisp & delicious. 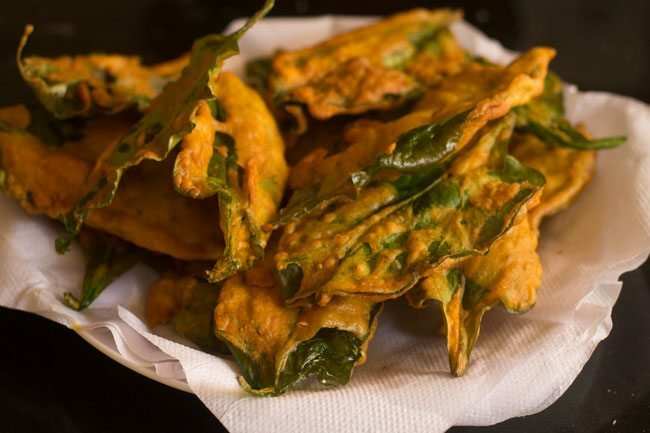 the fried palak pakoras become crisp and crunchy when each individual leaf is fried unlike the palak pakora recipe which i had posted earlier. 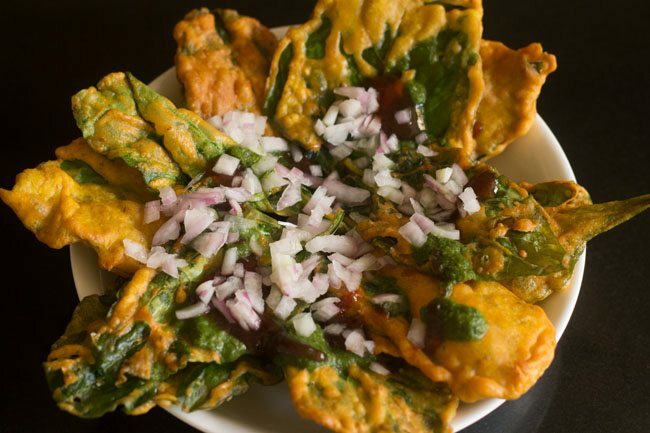 on top of these palak pakoras, you add your favorite chutneys, sev and finely chopped onions. 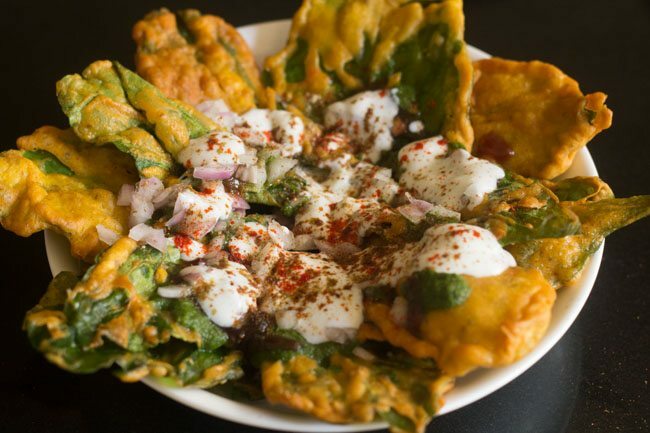 instead of papdi (flat crisp pooris) we use palak pakora as a base, topped with the chaat tidbits and spice powders. 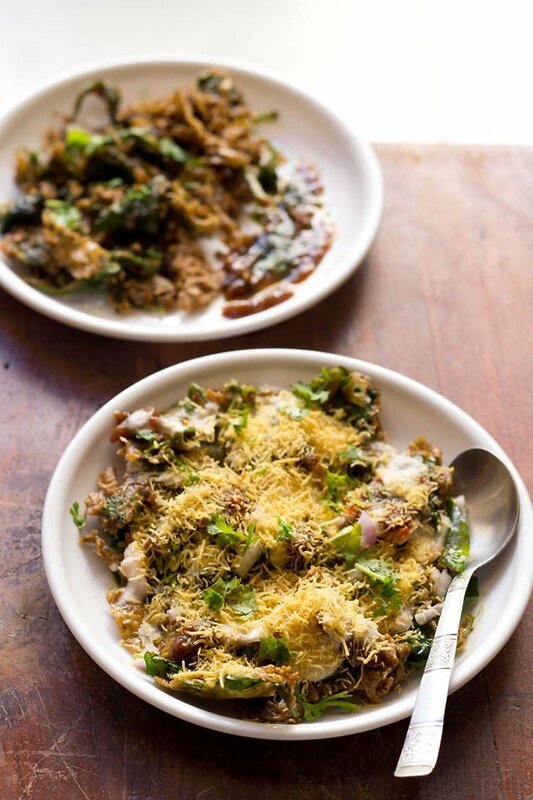 this palak chaat can be served as a snack or a starter dish. 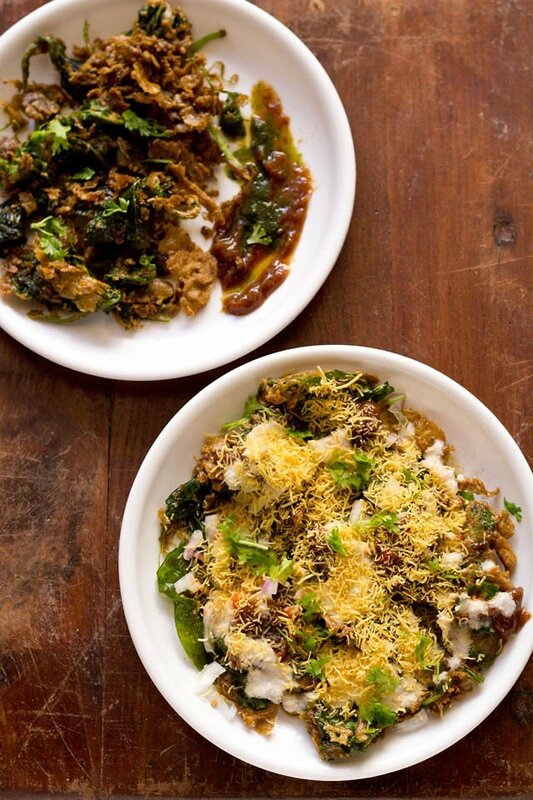 you will need both green chutney and sweet chaat chutney for this palak chaat. so make them a day before and keep in the fridge. i have also added a vegan yogurt in this chaat. 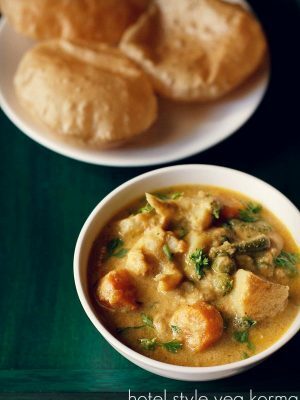 i added peanut yogurt which gave a very peanuty flavor in this chaat. 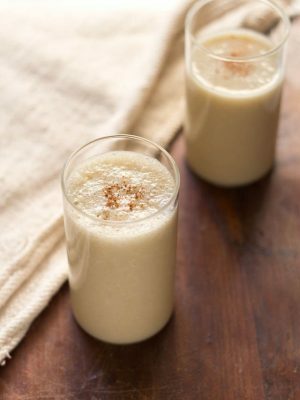 you can use any yogurt – milk yogurt or even cashew yogurt. 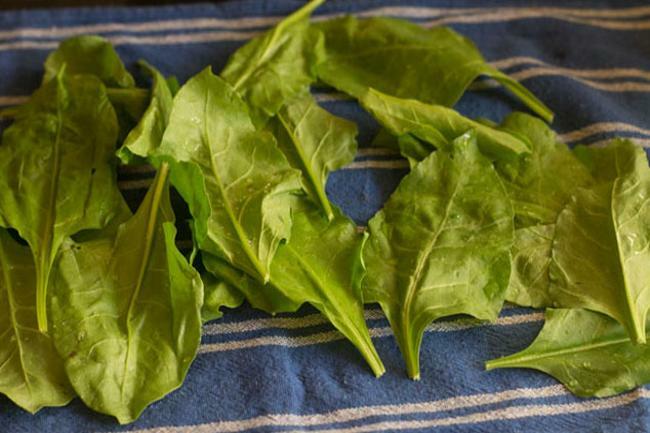 along with a few veggies, palak or spinach is one more veggie which most people don’t like, especially kids. we all know that spinach is very very good for health. spinach is a rich source of most vitamins like A, C, E, K, B2 and most essential minerals like iron, calcium, potassium, zinc etc. it is rich in antioxidants too. the homemade green chutney, tamarind-dates chutney & curd also contribute not only in taste but also nutrient wise. 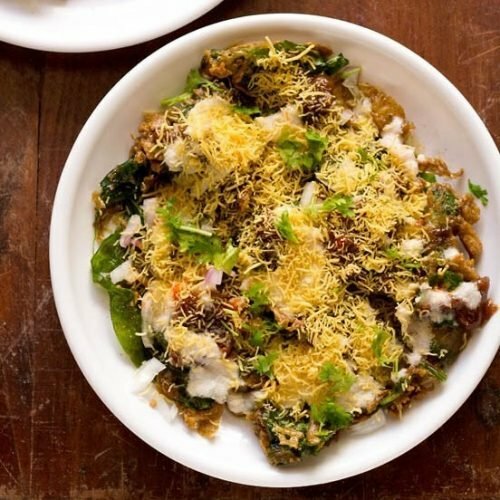 i am sure that this delicious palak chaat will make them reconsider their attitude towards palak and have it on their favorite menu. remove only the leaves from the palak bunch. rinse them well in water. wipe them dry with a kitchen towel. 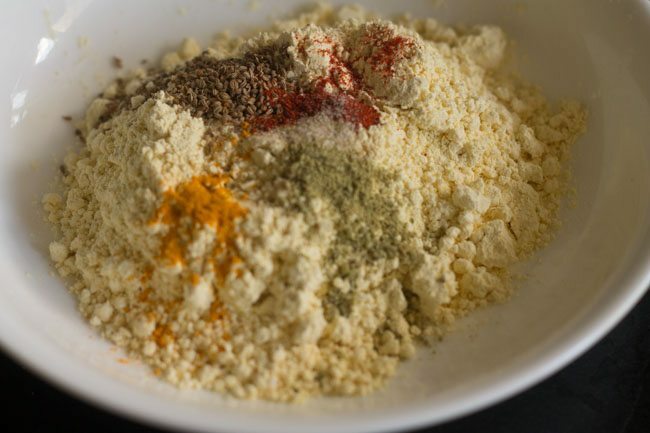 in a bowl mix all the dry ingredients - besan, turmeric powder, asafoetida, red chili powder, fennel powder, carom seeds and salt. 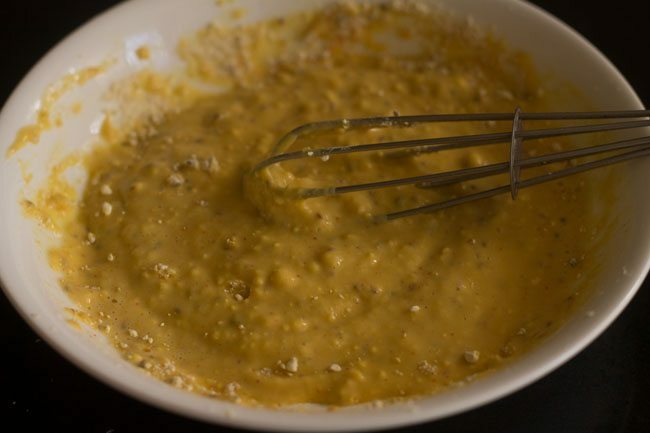 add water and make a thick flowing batter. 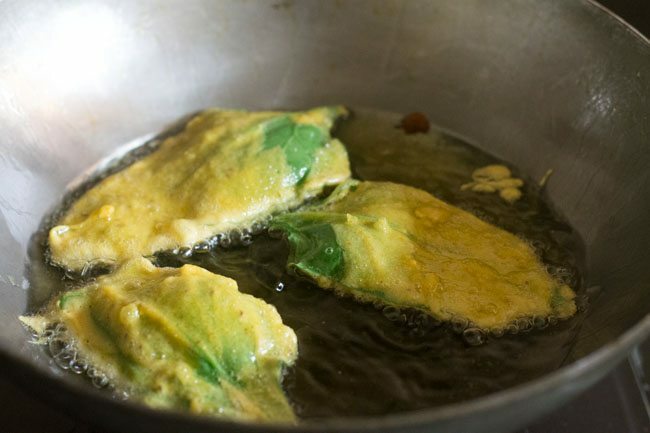 dip each spinach leaf in the batter and place them in the hot oil. fry them in batches till golden and crisp. drain on kitchen tissues to remove excess oil. on a serving plate/plates, place the fried palak pakoras. top with the green chutney and sweet chutney as required. pour 2 to 3 tablespoon of yogurt (curd) or as required. sprinkle with chaat masala, cumin powder, red chili powder, salt as required. top with some sev and crushed papdis (flat crisp puris). lastly garnish palak chaat with some chopped coriander leaves and pomegranate. 1. remove only the leaves from the palak bunch. 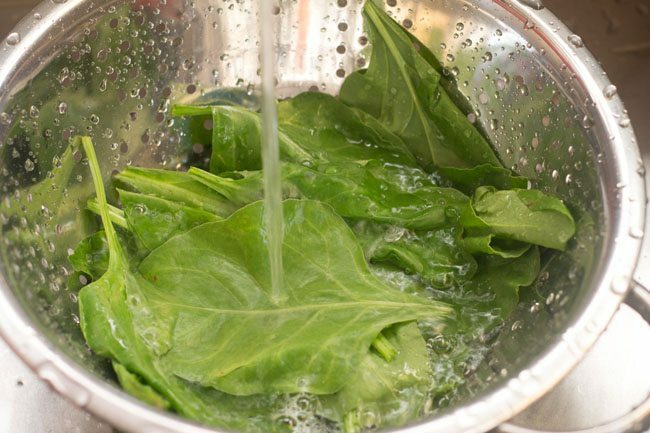 take about 12 to 15 medium sized spinach leaves (palak) and rinse them well in water. 2. wipe them dry with a kitchen towel. 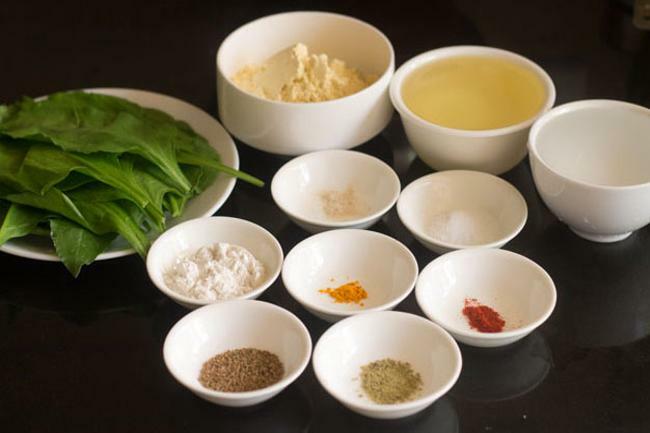 3. measure and keep all the ingredients ready for making palak pakora. 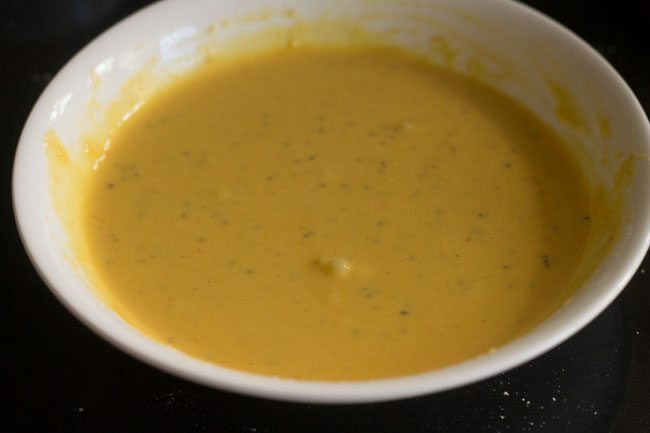 4. in a bowl mix all the dry ingredients – ½ cup besan (gram flour), 1 pinch of turmeric powder (haldi), 1 pinch of asafoetida (hing), 1 pinch of red chili powder (lal mirch powder), 1 generous pinch of fennel powder (saunf powder) and ¼ teaspoon carom seeds (ajwain). 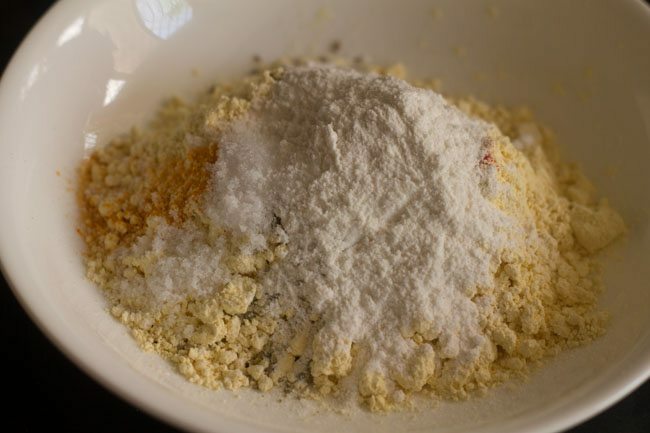 5. next add 1 tablespoon rice flour (optional) and salt as required. 7. add water as required. 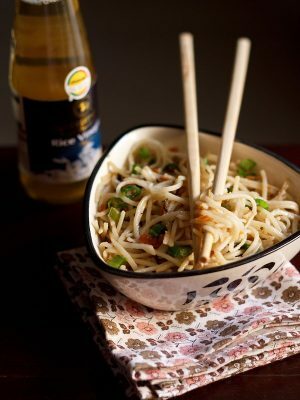 8. you can mix with a spoon or whisk with a wired whisk. 9. whisk till the batter is smooth. 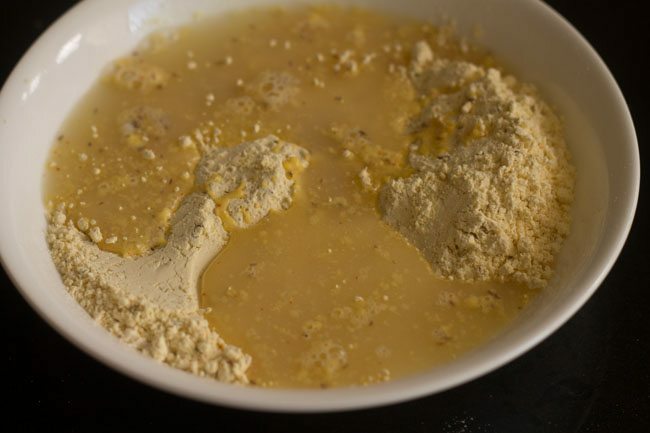 you need to make a thick flowing batter. 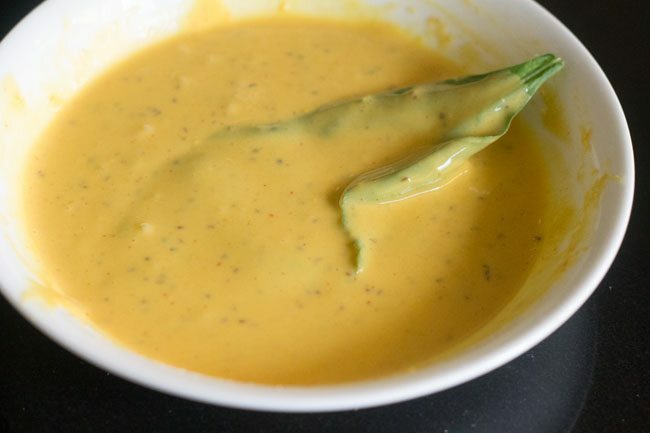 10. heat oil for frying palak pakora in a kadai or pan. dip each spinach leaf in the batter and place them in the hot oil. 11. fry them in batches till golden and crisp. 12. drain fried palak pakora on kitchen tissues to remove excess oil. 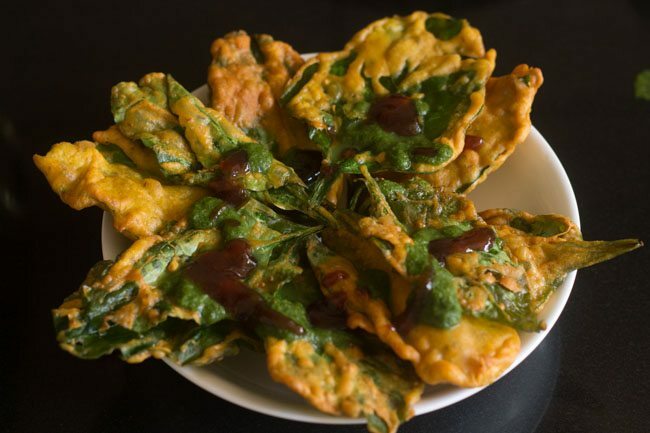 13. on a serving plate/plates, place the fried palak pakoras. 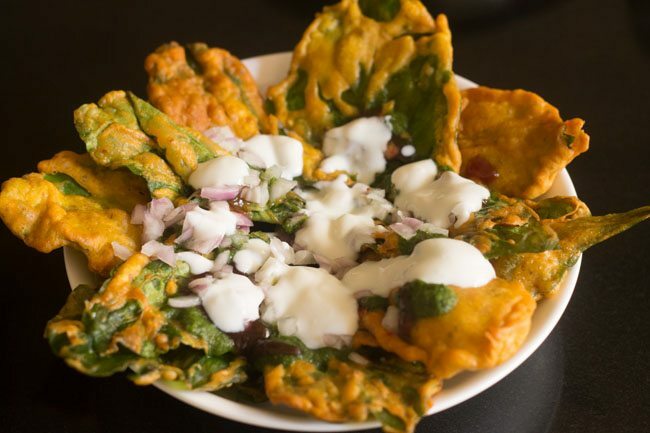 you can gently crush the fried palak pakoras before making the chaat, its optional. i have served the palak pakoras whole and also crushed. both ways it tastes good but if you have small kids then its better to crush and serve. 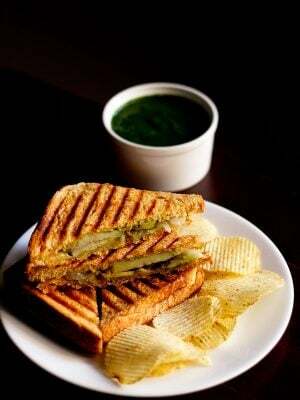 14. top with the green chutney and sweet chutney as required. 15. sprinkle some chopped onions. 16. pour 2 to 3 tablespoon of yogurt (dahi or curd) or add as required. 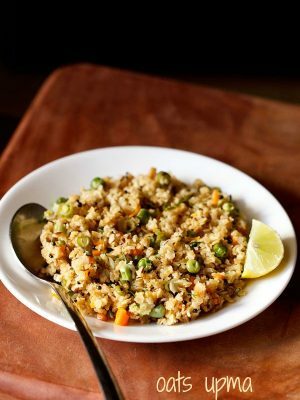 17. sprinkle with chaat masala, cumin powder, red chili powder and salt as required. 18. top with some sev and crushed papdis (flat crisp puris). 19. lastly garnish palak chaat with some chopped coriander leaves and pomegranate (optional). 20. garnish with more sev if you want. 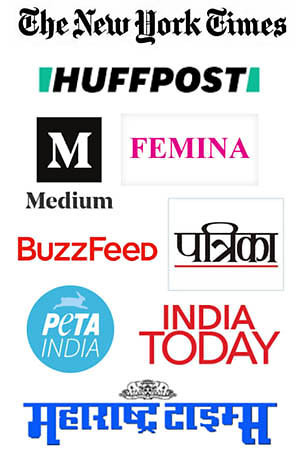 21. serve palak chaat immediately. 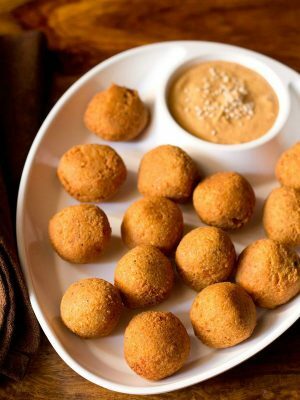 for more such tasty recipes you can check this collection of 32 chaat snacks recipes.